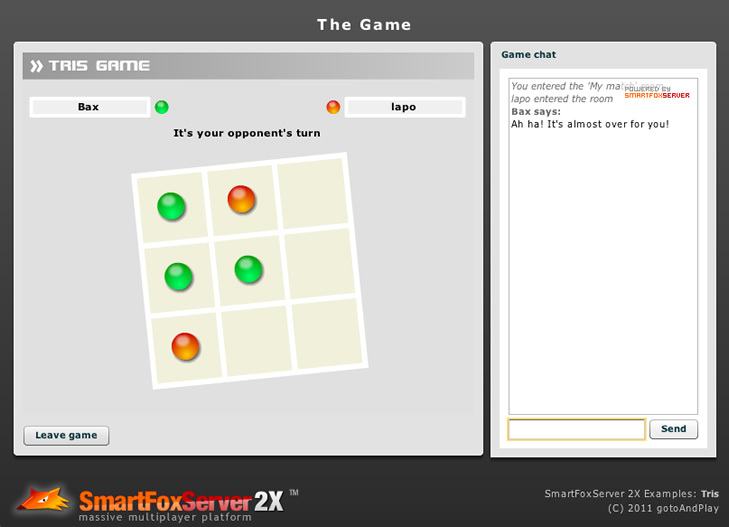 The following multiplayer games and applications offer a demonstration of the SmartFoxServer capabilities. They are all based on SmartFoxServer 2X (but most are available for SmartFoxServer Pro too) and run in all web browsers (although SFS is not limited to browser games of course). Source code and dedicated tutorials for most examples are available in the Examples sections of the SFS2X online documentation. In order to access the demos please fill the following form; you will receive a confirmation email to activate your username. After the activation you can run the examples using the Try me buttons below. BattleFarm is a fast-paced realtime multiplayer action game aimed at showing the capabilities of SmartFoxServer when creating realtime multiplayer games, the stunning performance of its BlueBox module and the flexibility of the SmartFoxBits components in creating user interfaces. 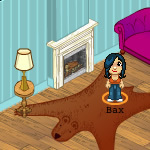 OpenSpace is a powerful framework for the Flash platform for rapid development of isometric multiplayer virtual worlds and MMO communities. 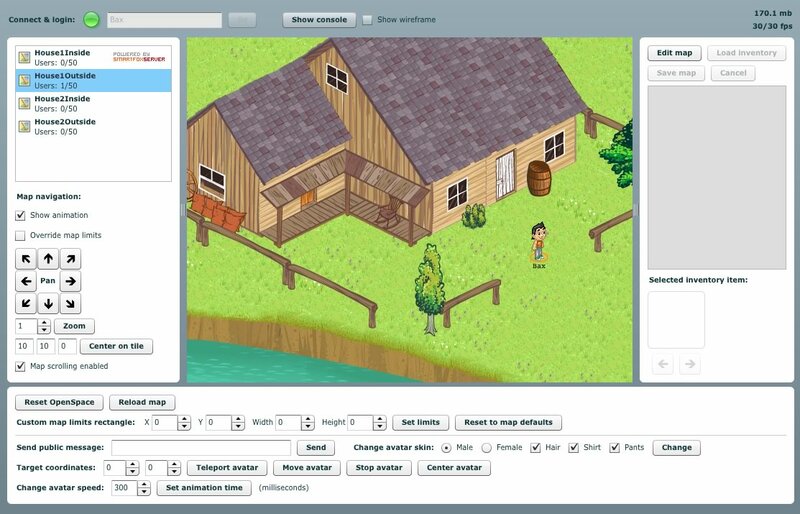 It allows the creation of advanced map architectures, including bridges and overpasses, with separate background layer for the best control over the map graphical appearance; it offers an advanced map scrolling engine which maximizes the rendering performance and allows the creation of larger maps. OpenSpace makes use of an extended breadth-first pathfinding algorithm which is able to handle tile elevation, slopes and different terrains; it gives the developer full control over the avatar creation process, disclosing countless possibilities. 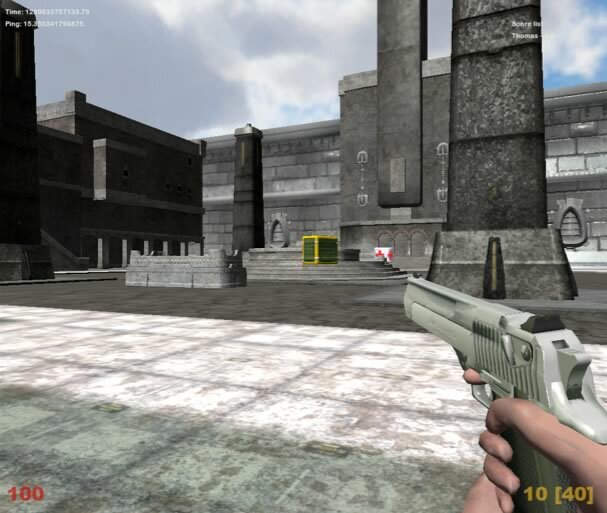 This demo shows the main capabilities of the OpenSpace engine. 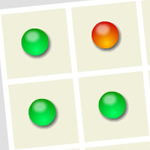 The Tris demo is a complete mutiplayer version of the famous "Tic-Tac-Toe" game developed using SmartFoxServer. 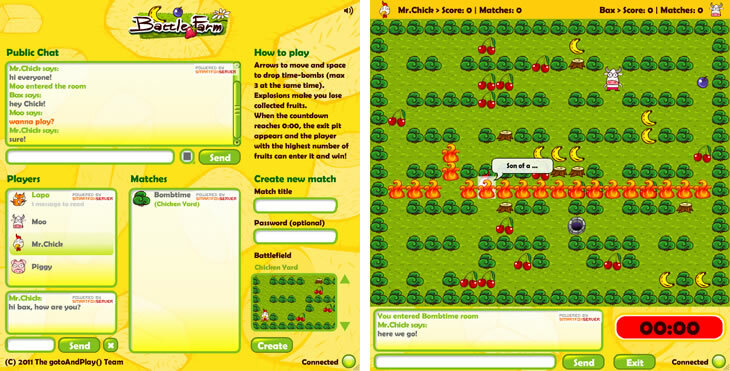 The game also features the "spectator" users, who can join a game to watch it, without actively partecipating. 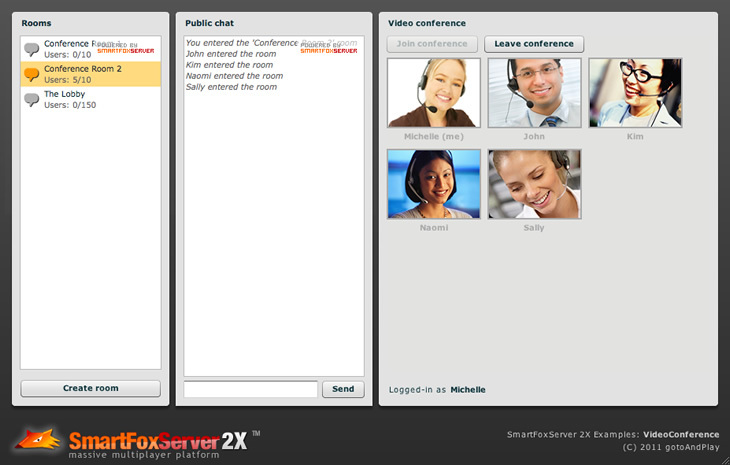 The RedBox is a free add-on for SmartFoxServer that adds audio and video streaming capabilities to the server, making it possible to include such features in any existing ActionScript3 application. The demo applications linked here showcase all the features (except videoclip recording and playing) made available by the RedBox to create video chats, video conferences and more. 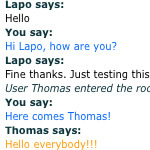 The Avatar Chat demo shows a basic virtual world in which the avatar movements are synchronized accross all the clients. 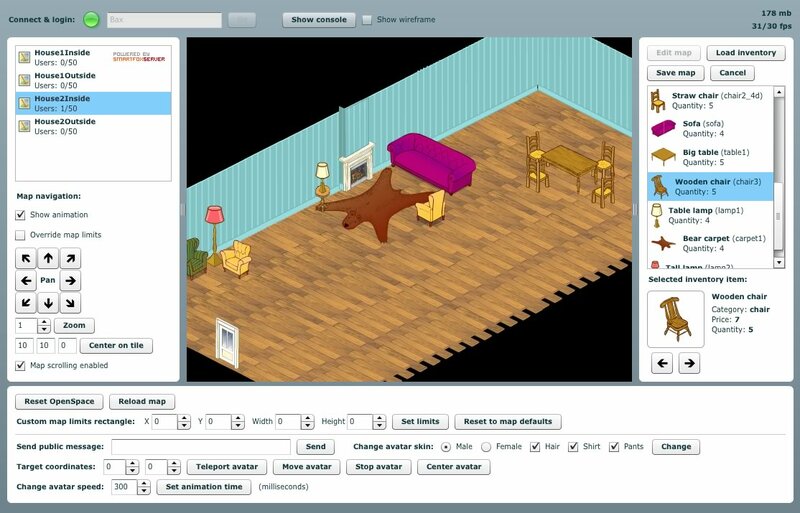 In case of more advanced requirements you may take a look at OpenSpace, the powerful ActionScript 3 isometric engine for rapid development of multi-user virtual worlds and MMO communities. The Buddy Messenger example demonstrates the client-side capabilities of the Buddy List API. 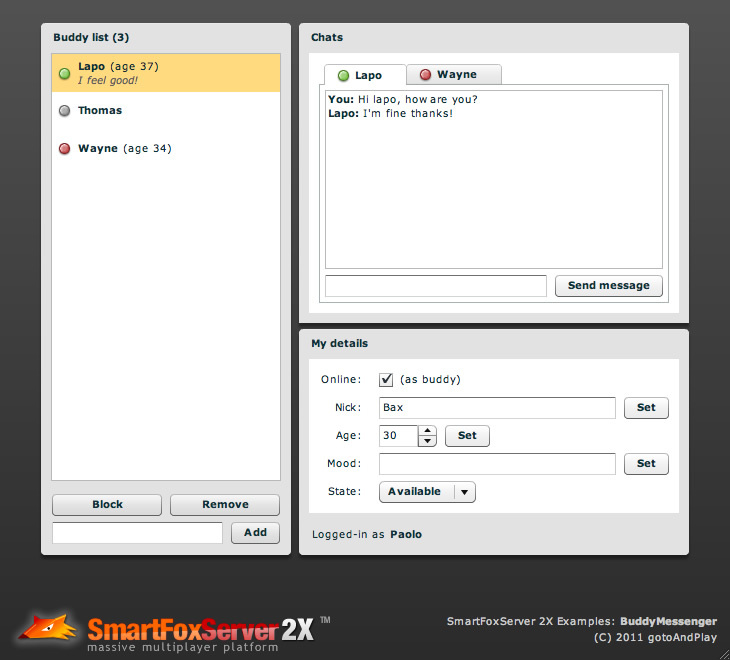 With this subset of the SmartFoxServer API, developers can add an instant messenger-like interface to any application, allowing users to see the status of friends in their contact list and communicate with them regardless of the SmartFoxServer Room they are connected to. 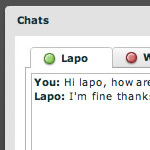 The Advanced Chat example is a feature-rich chat application which includes public and private chat, messages coloring, advanced room management capabilities and more. 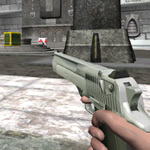 This demo showcases a first person shooter (FPS) implementation on SmartFoxServer 2X with Unity 3D. It uses the UDP protocol to communicate with the authoritative server, remote players interpolation and extrapolation techniques and more.